TCRD is open to everyone 18+ who wants to play! TCRD has its roots in men’s roller derby, but we are an all-gender, lgbtq+ friendly league open to everyone 18 and older. Derby is fun, challenging, and a great workout. You’ll get to skate with members of (and try out for) our nationally-ranked travel team, the Twin Cities Terrors. We also have a local home season so all levels of skaters are welcome. Haven’t skated since your friend’s birthday party in 4th grade? We will teach you to skate, stop, jump, and hit in our “Raptors” training program! Former hockey player? Skate all the time and looking for a challenge?? We’ll give it to you! Our “Raptors” training program is where you’ll learn to skate, hit, dodge, and spin your way to roller derby excellence. Raptors practice is held at the same time and place as normal league practice, and is lead by an experienced TCRD trainer. We have all levels of skaters participating so no matter where you are on your derby journey you’ll fit in and have a great time. What does practice look like? Fun! 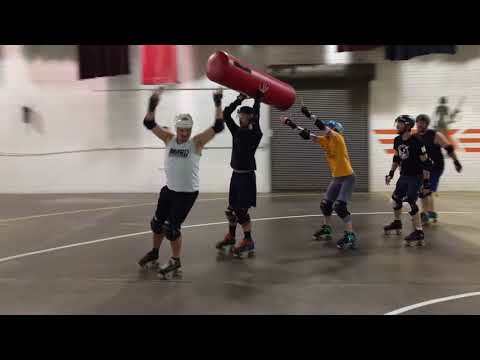 Raptor training takes place on a separate skating track so there is no danger of unintended contact, but skaters get to interact with the league, meet people, and see where they’re aiming. TCRD practices are generally 2 hours in length and include a warmup, cardio, core skills, drills, and internal scrimmages. After practice there is usually group stretching.